Many people start their journey towards parenthood with a pet. My boyfriend, now husband, gave me an adorable kitten as a graduation gift not long after we moved in together. Animals are such loyal and lovable creatures. There is a comfort in knowing they are around. Curling up to snuggle a furbaby really does have some great healing powers. The other great thing about having a pet at home is that you can blame all those weird noises and house creaks on them. It’s not a home invasion, it’s the cat. It’s not the kids awake when they should be asleep, it’s the cat. Those noises are scarier when said animal is not there. Our cat, Snickers, had a reputation for being vicious. She earned her name from her gorgeous coloring like the candy bar. 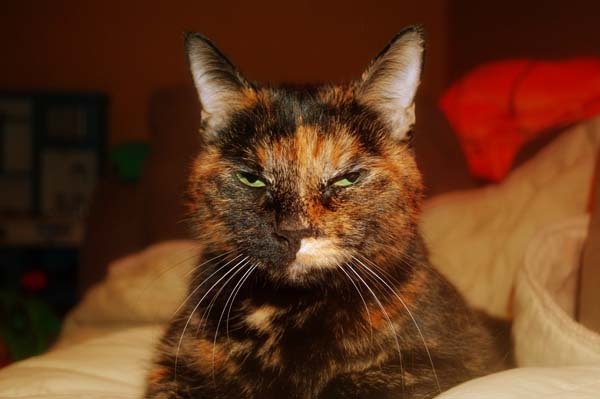 Sadly, the Tortoiseshell breed are territorial and timid. She was long misunderstood. What people didn’t see was a kitten who played with your toes under the covers or the sweet old cat that slept by my side. And no one saw the sweet evenings where she insisted on lying awkwardly on us, prohibiting any productivity while insisting on being pet. Her purring was enough to relieve the day’s stress. A few months ago, our Snickers started to act a little off. I noticed she was sticking her tongue out almost all of the time. It almost looked as if she were dehydrated but I knew she was drinking water. Mind you, that water came solely from the bath tub and never from the actual cat bowl. (Snickers was a quirky cat.) Her eating had decreased and her breath seemed really bad. At first I thought and hoped it may be a tooth ache. I put it off for a few days and watched her closely. She ate a bit better when I gave her some wet food and I figured it was ok to spoil her a bit if she was not feeling well or was having trouble with the dry food. When she was a kitten and we took her to a local vet to be spayed, we learned about her demeanor. Her chart was covered in stickers that read, “Caution!” and “Animal will bite!” I assure you she was not that bad. But that event made it tough for us to bring her to the vet from there on out. The one other time she needed a rabies shot after catching some mice was equally awful. It was suggested we sedate her before any further vet visits. So, as you can imagine, the thought of bringing her to the vet was a bit overwhelming. I stopped in before the weekend to ask about sedation and they suggested we bring her in and that they would block extra time should she need to be examined. So that Monday, I took out the carrier and while my older two were in school, my youngest and I took her to the vet. It’s really heartbreaking to see any creature so terrified. The vet tried to get close to her, but Snickers was not having it. I was so grateful that the vet was so patient and understanding that Snickers was just scared to be there. Everyone at the Whitman Animal Hospital was so kind. We agreed that we needed to sedate Snickers to get a real look inside her mouth and figure out what was going on with her. It only took a few seconds for the sedation to set in. I hated knowing she was so scared and angry before she was put under. I stayed close by and pet her while the vet looked her over. When the vet opened up her mouth, I could not believe my eyes. The entire roof of her mouth was covered in an awful tumor. I knew instantly that I wouldn’t be bringing my cat home with me, but I never really expected it to all go so quickly. The doctor was pretty positive that it was a fast-moving cancer and that it had only been there a few weeks at most. He thought it would be very hard to treat but offered me the option to have it biopsied and such. With a heavy heart, I chose to not wake her from the sedation and to let her go over the rainbow. I felt, and the vet agreed, it was the humane thing to do for her. She was loved for 13 years. And she’s missed almost daily still. 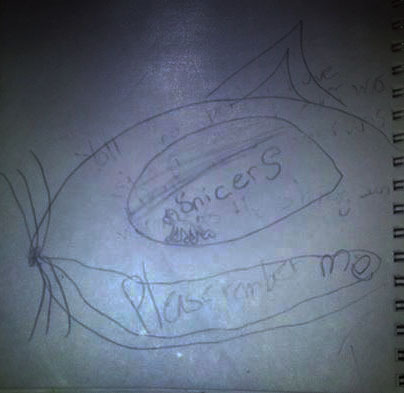 About a week after we let her go, I found this very moving drawing in a notebook by my eight year old’s bed. I was incredibly moved by the maturity and artistry in Lucy’s drawing. Even if it’s unintentional, it says so much. Erased in the background of the face but still legible, “You’ll find better love than ever was… deeper than the river runs… warm as the shining sun.” The words “Please remember me” in the mouth, and the image of the cat and her name in the cat’s eye. Lucy has always had an old soul and I can’t help but love her all that much more for drawing this for me. I thanked her and could tell that she did it to make me happy and not sad. And for that, I am just that: happy to have loved our fur baby, Snickers, for her feisty and unique self. Crying!! Such a great post…very well written. Thank you for sharing this story. Snickers is missed by all. You were a great FurMommy to her, she was very loved! !